Just look at these beaming smiles!….and this was before the race! I’m going take this opportunity to give a huge shout out to Coach Caroline for bringing most of these female triathletes confidently to the point where they are excited and happy to be doing there first triathlon. 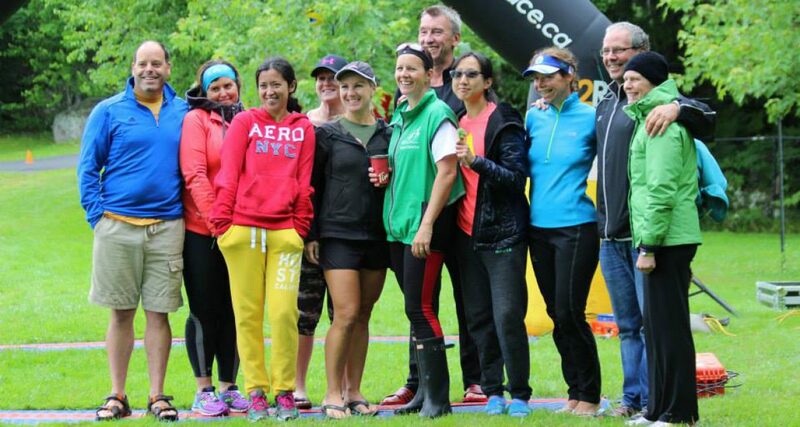 We are missing a couple from the “My First Triathlon” group – but understand they are going to take the “plunge” at another local race real soon. Thanks to Tanya (and Chris McInnes) & crew for hosting this year’s event – it was a grand day and one where our club really shined. Many placed well and a few that were newbies last year improved significantly – namely Phil Outerleys who worked extremely diligently on his swimming to get himself on the podium in his age class…well done! And Eric who continues to surprise us with his endurance…holy moly he keeps on going and also getting faster, but he seems to like the kms. The junior ranks are coming along with Adam consistently taking top spots in the sprint events. WE are fortunate to have a few good triathlons close to home…Bridgetown is next weekend for anyone that has the bug and wants to have a go. There is a good variety of events including teams and the aqua-bike if you’re not up for doing it all. Check the schedule for other triathlons coming up (on Atlantic Chip Timing – where results are also posted). Of particular note is the Port Hood Triathlon that is at risk of being cancelled if not enough registrations asap. Unfortunately waiting until the last minute to register is more than a bit of a challenge for race directors. While I’m talking about upcoming races….. check out the Rockwood Relays in St John and if anyone is interested this sounds like a great event- it was new last year. The Rockwood Park facility is awesome. There are also a number of kids events coming up…Bridgetown is this coming Saturday….and I hope some of our kids form the kids program will give it a tri! Tuesday will be a track workout with Tineke at Acadia – 5:30 PM to warm up. Congratulations to all! So well done and so joyful in doing it! Previous Previous post: Race Prep Week For Many!